In any book that is a collection of primary source documents, it can be difficult to decide whether an author is genuinely the author or an editor. In this book it is even more of a challenge because the two authors have created a structure that is every bit authorship, but they have also performed an essential editorial function in selecting and incorporating the primary source documents. The result is a powerful and delightful book that conveys the hopes and experiences of a group of people who are communicating with those colleagues left behind in civilian jobs. Highly Recommended. DESCRIPTION: In any book that is a collection of primary source documents, it can be difficult to decide whether an author is genuinely the author or an editor. In this book it is even more of a challenge because the two authors have created a structure that is every bit authorship, but they have also performed an essential editorial function in selecting and incorporating the primary source documents. The result is a powerful and delightful book that conveys the hopes and experiences of a group of people who are communicating with those colleagues left behind in civilian jobs. Highly Recommended. The Great War of 1914-1918 can be very difficult to understand today because so much was very different from the societies of 70 years later and a different world from that 100 years on. The war letters of the men of the Great Western Railway go a long way to set out the world they inhabited. There was a sense of order, social discipline, with each having a place in the world and understanding how that related to family, colleagues, social classes and society. There was a strong sense of duty and national pride. There was also a confidence in the British Empire and its monarchy. When the war began, young men, and also not so young men, flocked to the colours. Society expected every able bodied man to step forward and put on a uniform, and yet there was still a pressing need to man the factories, the mines and the railways. At that time it was considered man’s work, creating a conflict between duty in uniform and duty to keep the country running. What was perhaps most different from later society, even in 1939 when the next major war began, is that in 1914, men volunteered to fight as groups of friends from the same streets and the same industries and companies. At that time, communities were much tighter and few people ventured far from where they were born. Families in generations served companies and a job was often for life. Those entering the service of the Great Western Railway mostly never considered that they would ever do anything different or leave the employ of the company. Then war and duty encouraged so many to put on uniform and go off to fight in France and in the other theatres of war. Some of the jobs made vacant were filled by women for the first time, but without without this influx of new workers, the jobs became harder as a smaller work force had to try to meet the expanding needs of war. Railways were the major form of land transport for troops, munitions, military equipment and all that was required to keep the troops and those at home fed and clothed. This book provides valuable insights and tells the stories, through the letters, in chronological order. There is a great deal of humour and graphic detail, sensitivity, sober reflection. 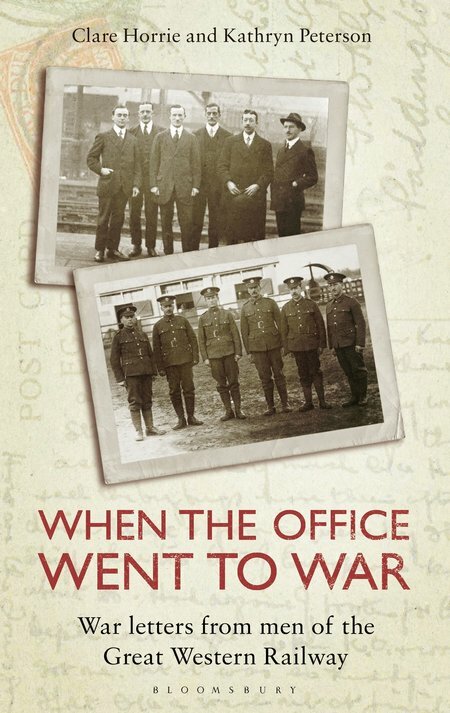 What makes this collection of material unique is that the Audit Office was a clear entity and those that went to war continued to write to their colleagues in the office, bridging the gulf that had come between them. It is also a very moving collection of stories. One fascinating aspect is that both groups of colleagues assumed that they would eventually be re-united and take up where they had left off. The next story, that is beyond the book, is whether they made that reality after 1918 in a world that had changed significantly and where the values of 1914 were challenged by a new order.